At the 26th Moscow International Book Fair, book publishers discussed the main challenges facing their industry: the rise of electronic technologies and the drop in interest in reading. At the same time, visitors enjoyed meeting writers and exploring numerous creative spaces. During the first week of September, the Moscow International Book Fair once again took over Pavilion 75 of the All-Russian Exhibition Center. Every year, book publishers and reading enthusiasts gather here to look one another in the eye, have a heart-to-heart talk, and discuss the problems faced by the industry, which has become shaky since the Internet and electronic technologies started snapping at paper’s heels. In fact, digitization was the focus of the roundtables and meetings at the Knigabyte business forum. The business program also addressed the crisis in the book industry and ways to develop the book trade, which is currently going through difficulties in Russia. Even in Moscow, bookstores are disappearing because many of them cannot pay their leases, and they do not earn the money back in sales. Small, original bookstores are well-known mainly among people who move in literary circles. The large bookstores are generally dominated by mass-produced volumes of fiction and popular literature. “In Manhattan, there are many times more bookstores than in all of Moscow,” says Boris Kupriyanov, the co-founder of the esteemed Moscow bookstore Falanster, a developer and initiator of reform in Moscow libraries, and the deputy director of the Moscow Library Center. Experts say that one way to remedy the situation could be to create sites for communal reading, perhaps in parks or libraries. All participants in a roundtable on book innovations agreed that the virtual landscape is good, but there is still a need to hold on to so-called book points as a reminder that books have not completely shifted to an electronic format. 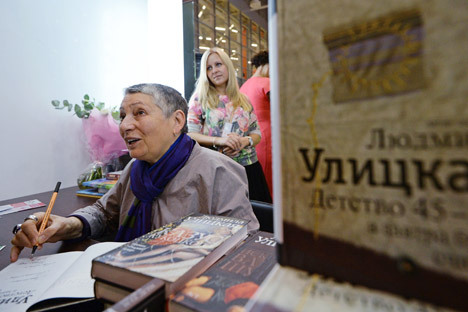 The readers’ program had a full schedule of events with today’s most celebrated Russian authors, including Boris Akunin, Ludmila Ulitskaya, Dmitry Bykov, Ludmilla Petrushevskaya and Tatyana Tolstaya. Among the notable foreign writers who visited the event were David Mitchell (who spoke about “Cloud Atlas” and the specifics of adapting books for the screen) and Joe Abercrombie (he and Russian writer Dmitry Glukhovsky discussed the future of fantasy), as well as acclaimed French writer Bernard Werber, whose works enjoy particular popularity in Russia. In addition to the considerable societal and humanitarian value of this publication, which gathers eyewitness accounts of post-war life all over the Soviet Union, the book has a purely practical benefit: The writer said that one-third of the profits from the publication will go to Golfstream, a charity that helps sick children. Sergey Shargunov—one of the most famous writers of the “thirty-something generation”—presented his new novel, “1993: A Family Portrait against a Backdrop of a Burning House.” The book is about the painful and penetrating theme of Russian society in 1993, when the political putsch occurred. Among the newly unveiled books at the festival,a three-volume work dedicated to Boris Pasternak and his father, Leonid Pasternak, a talented artist, deserved special attention. The books in the set are the fruit of 15 years of labor, which included the participation of Boris Pasternak’s late son, Yevgeny, and his family. The three-volume set contains a reprint of the exalted novel “Doctor Zhivago,” which is illustrated with drawings by Leonid Pasternak and includes research by the literary scholar Lazar Fleishman on Boris Pasternak’s Nobel Prize for Literature win and his subsequent harassment. The set also contains never-before-published correspondence and “Notes on Art” by Leonid Pasternak. This year’s fair attracted an exceptionally large number of children. This was not surprising: The children’s program was given particular attention and, for the first time, there were two children’s areas operating. The booths belonging to children’s publishers were eye catching and, in places, they even overshadowed the “adult” book publishers, while the business program included seminars and roundtables of children’s literature publishers. Discussing optimal formats and the balance between re-issuing classics and contemporary writers, book publishers and critics agreed that children’s literature in Russia is currently on an upswing. There are many talented writers and mechanisms to give them exposure—for instance, competitions, among which the most significant are Kniguru and New Children’s Book. The BOOKMARKET multimedia festival of living literature in Muzeon Park in central Moscow was a fitting supplement to the fair’s main program. This festival, which was held for the fifth time this year, is characterized by an especially informal atmosphere, where musicians appear along with writers and discussions are particularly lively.